Home of a Rebel Sharpshooter. A Harvest of Death. Gettysburg, Pennsylvania. Slowly, over the misty fields of Gettysburg—as all reluctant to expose their ghastly horrors to the light—came the sunless morn, after the retreat by Lee’s broken army. Through the shadowy vapors, it was, indeed, a “harvest of death” that was presented; hundreds and hundreds of torn Union and rebel soldiers—although many of the former were already interred—strewed the now quiet fighting ground, soaked by the rain, which for two days had drenched the country with its fitful showers. A battle has been often the subject of elaborate description; but it can be described in one simple word, devilish! and the distorted dead recall the ancient legends of men torn in pieces by the savage wantonness of fiends. Swept down without preparation, the shattered bodies fall in all conceivable positions. The rebels represented in the photograph are without shoes. These were always removed from the feet of the dead on account of the pressing need of the survivors. The pockets turned inside out also show that appropriation did not cease with the coverings of the feet. Around is scattered the litter of the battle-field, accoutrements, ammunition, rags, cups and canteens, crackers, haversacks, &c., and letters that may tell the name of the owner, although the majority will surely be buried unknown by strangers, and in a strange land. Killed in the frantic efforts to break the steady lines of an army or patriots, whose heroism only excelled theirs in motive, they paid with life the price of their treason, and when the wicked strife was finished, found nameless graves, far from home and kindred. 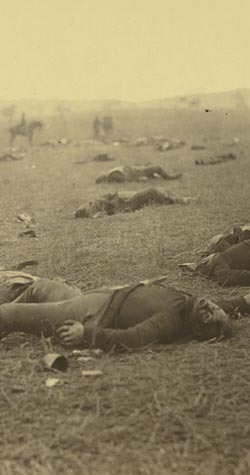 A Harvest of Death, Gettysburg, Pennsylvania. July, 1863. Albumen print photograph by Timothy O'Sullvan.